Some of the Free RPG Day indie releases I picked up. 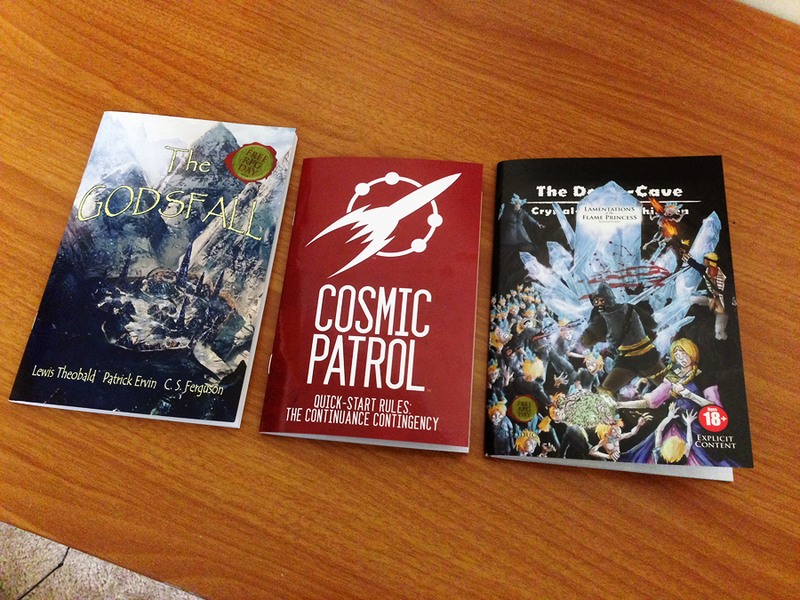 From left to right: Godsfall, Cosmic Patrol and Lamentations of the Flame Princess. I’ve been aware of Free RPG Day, established in 2007, for some time now but for one reason or another wasn’t able to pick up any of the free releases; either forgot about it or was out of town. It was pure coincidence that I was in my local game shop on Saturday looking to buy a book, when I noticed a small group of people circling a table at the front of the store. After seeing the many products for Free RPG Day 2014 laid out, I decided to put off my planned purchase and get some free games instead. I got a good bit of products, including the adventures from Pathfinder “Risen from the Sands” and 13 Age’s “Make Your Own Luck,” but I was pretty excited to pick up some independent games that I’ve never heard of (Godsfall and Cosmic Patrol) or heard of and wanted to check out (Lamentations of the Flame Princess). Below are some short thoughts of the indie games I checked out. The Godsfall Free RPG Day release by Boothroyd and Allnut. 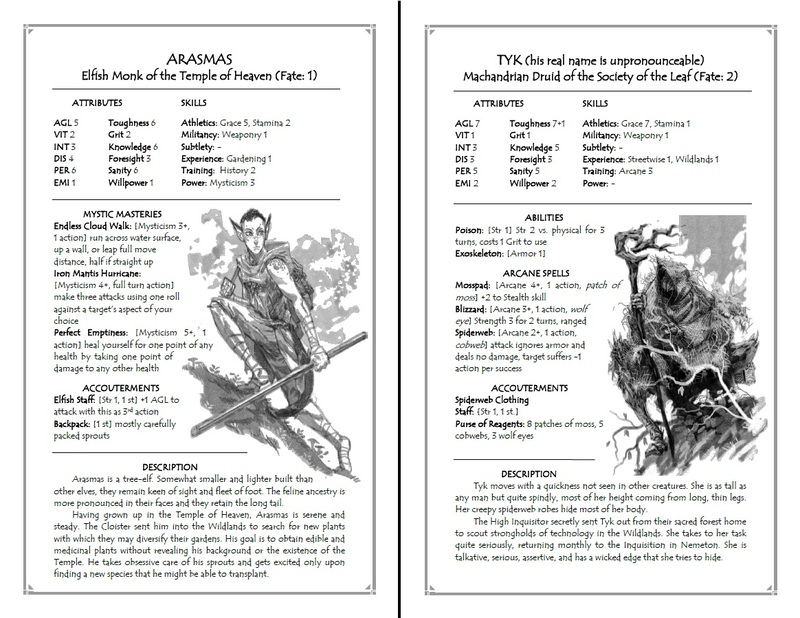 The Godsfall RPG release for Free RPG Day is a 20-page digest sized pamphlet game that includes rules, pre-made characters, an adventure, NPCs and enemy stats. 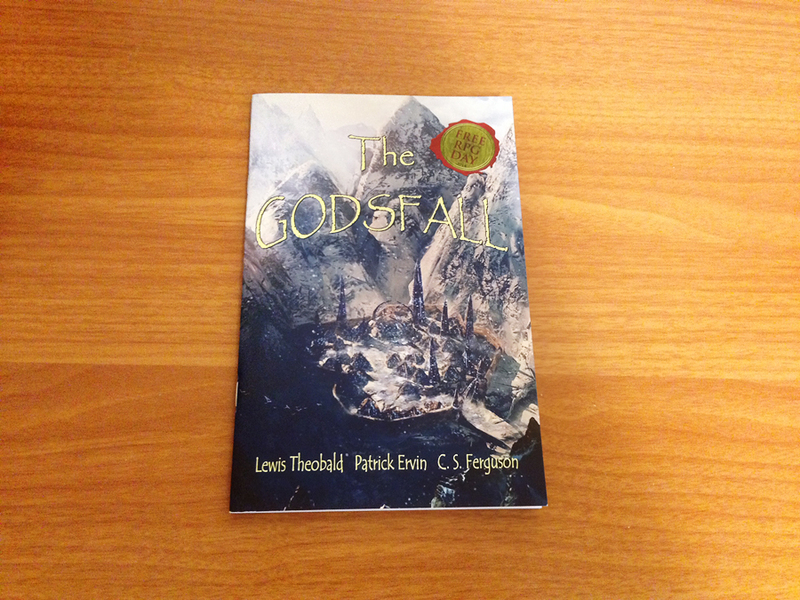 The Godsfall game is based in a post-apocalyptic fantasy world following a “god’s fall” that has changed the world. Out of all the indie releases I picked up, this has to be the best in presentation. The background on the world and characters is short, but interesting. 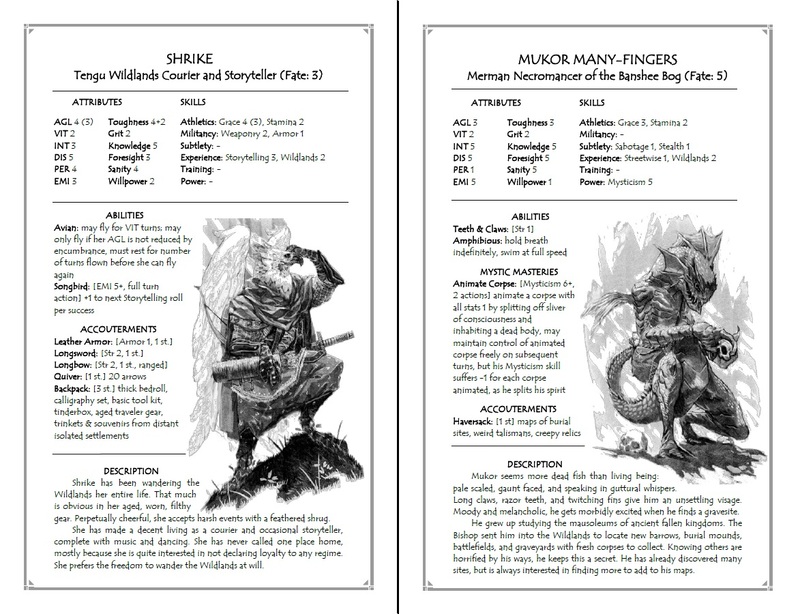 I like that there’s a variety of characters players can use in the game from the traditional monk to a merman necromancer! I also love the black and white art in the book, as well as the cover. The artwork is a strong point in Godsfall. Check out some of the pre-made characters and artwork below found in the book. The mechanics are pretty straightforward and simple to use with the game only using a six-sided die. The combat system is a bit slow compared to what I’m used to. It’s comprised of rolling dice and comparing it to the opponent’s dice to see if a player succeeds in attacking/defending in a given confrontation. The adventure revolves around investigating attacks on caravans along a dangerous road. There’s of course more to it than that with some encounters and a cliffhanger ending. I played it with a few people on Saturday and enjoyed the experience. It’s very much in the vein of a traditional fantasy RPG. I would be interested to see the official release of the game which is scheduled for September 2014 following a recently successful Kickstarter. Lamentations of the Flame Princess, a fantasy based game set in 17th century Europe, is an RPG I’ve heard of but never really got into. Of course I’ve been meaning to ever since I started getting into weird and strange games, i.e. Numenera. 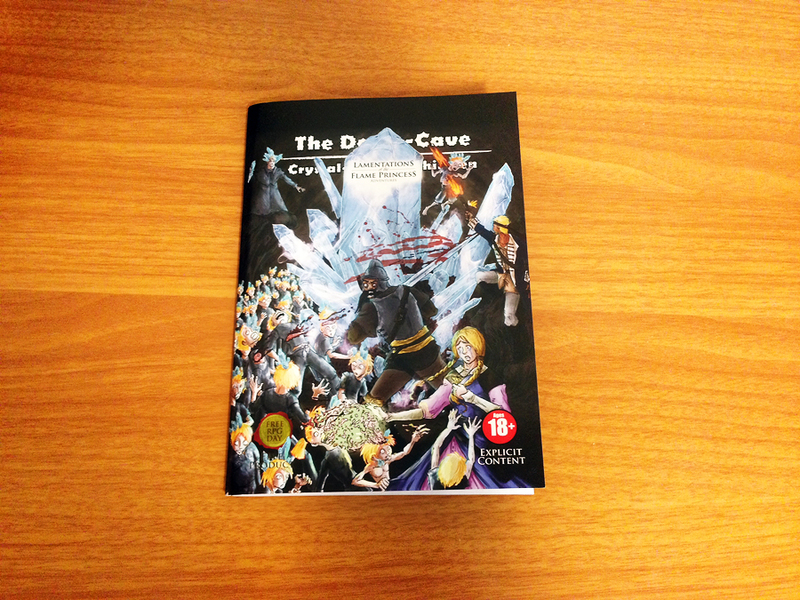 “The Doom-Cave of the Crystal Headed Children” is a very weird and strange, but also horrific and very deadly adventure. (see that “Ages 18+ Explicit Content” stamp on the cover?). The cover of the heroes cutting up and blasting the “Crystal Headed Children” is showing just a brief glimpse at the insanity of this 36 paged digest sized pamphlet adventure which is completely devoted to the dungeon,”The Doom-Cave,” with the inside cover of the book acting as a pull out map. 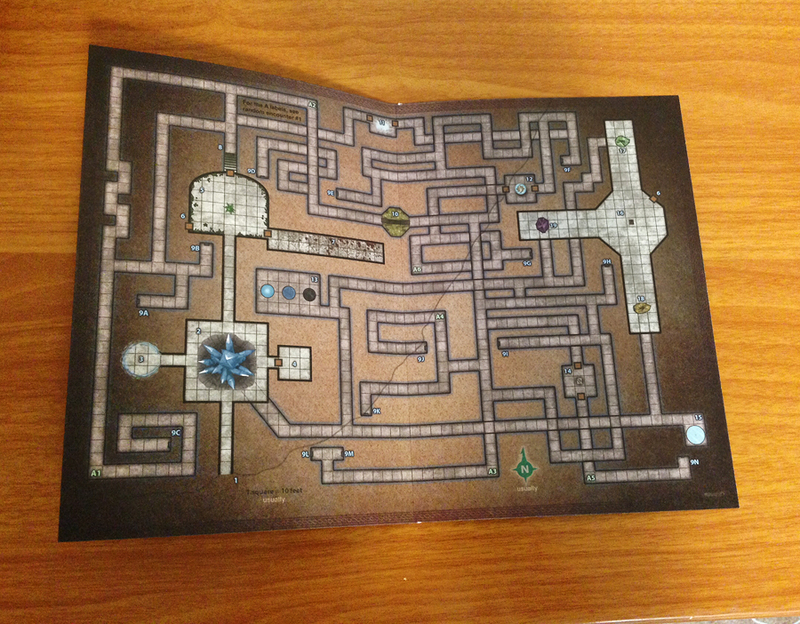 Inside book cover to the “Doom-cave of the Crystal Headed Children,” the adventure released by Lamentation of the Flame Princess for Free RPG Day. I didn’t mind in the least that the adventure did not have any rules or pre-made characters; there are links provided to the free rules of the game. There’s a lot of material here, and it’s a bit surprising to me that it’s being offered for free. The adventure begins when players happen to come across women in a town searching for their sons who happen to be named Andrew, with the only problem being no one in the town has ever seen or heard of the women’s children. Without spoiling too much of the game, the players eventually make their way to a cave and begin to unravel what’s happening. I don’t think I’ve ever come across an adventure this odd before. There are a lot of things in the dungeon that can have serious and strange ramifications for PCs. The encounters as well steer into those categories as well. If I took anything away from this adventure is that nothing is out of bounds, and that’s exactly what writer James Edward Raggi IV is aiming for. 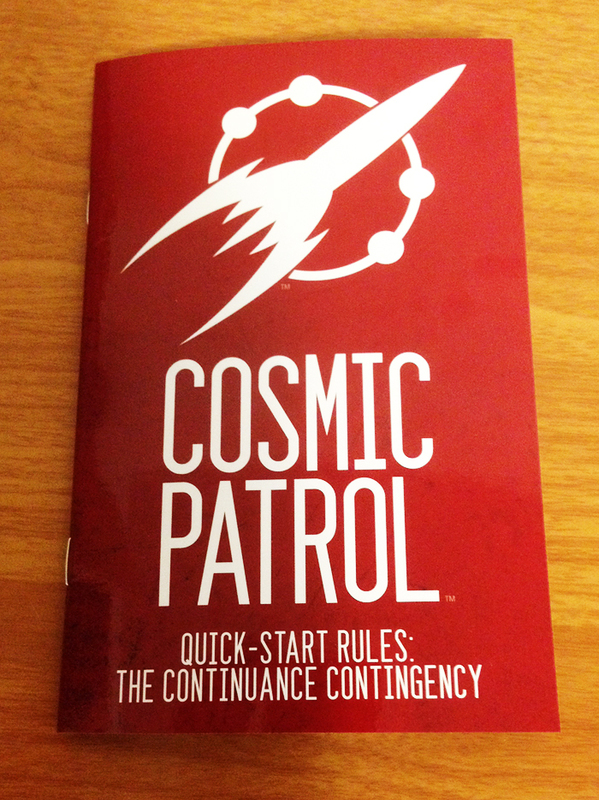 Cosmic Patrol by Catalyst Games is a 24 page digest sized pamphlet game that includes rules, pre-made characters and some mini-adventures. The game is based on the Golden Age of pulp science fiction; the game cites the covers of the 1930s-1960s science fiction magazines as inspiration for the game. The rules for the game are pretty simple to understand, so much so in fact that when I was reading through it I wanted to run it for Free RPG Day, but found out someone had already planned to run Godsfall. What I found interesting about this game was that there was no set game master. The game employs a Lead Narrator (the game master) for one scene of the adventure. Following the end of that scene, another player takes up the mantle of the LN with the outgoing LN becoming a player. I’ve heard of setups like this before, but this was the first game that I picked up that actually had the rules detailing how this collaborative narration works. The mini-adventures are pretty straightforward for a science fiction game, from the examination of an alien ship to investigating strange occurrences on planetoids. From the tone of the adventures to the characters (Earth based, Mars based, automatons, etc. ), Cosmic Patrol does a good job of replicating adventures that you might find in movie serials, books and magazines of the Golden Age time period that the writers wanted to immerse players in. It’s a pretty simple game to get into for people who want a specific tone and feel out of a science fiction RPG game.